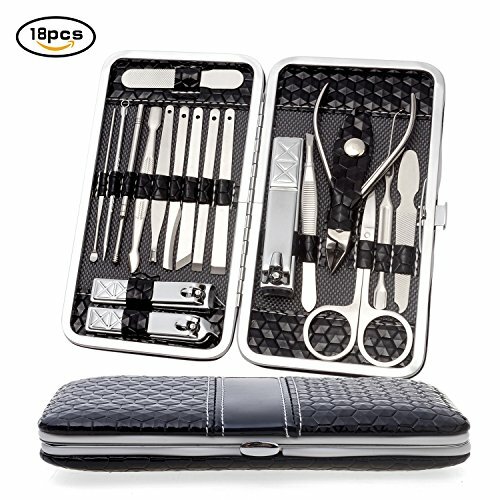 18 Pieces Manicure Pedicure Set: Including Nail Clippers, Eyebrow scissors, V-Shaped Cuticle Trimmer, Ear Pick, Cuticle Nippers, Nail File, Eyebrow Tweezers, Acne Needle and Loop Extractor, Pedicure Knives, Single-edged Double-sided Push Stick, Peeling Knife, Cuticle knife. The Manicure/ Pedicure Kit gives you all the essentials to create your perfect manicure pedicure at home, it should definitely be part of your arsenal. Precise Nail Scissors Grooming Kits: Nail clipper set (large and small) contains fingernail and toenail clippers giving you the right tool for the job while reducing the risk of spreading nail fungus. It is perfect matching between the radian of blade of nail clippers and the radian of your nails. Portable & Light weighted Beauty Cosmetic Toiletry Tools: The set comes in a durable case for safe travel and storage. The case dimensions: 6.3*3.5*0.9 inches, and weight 0.27KG, the sleek case easily fits into handbag or luggage. 100% Stainless Steel High quality Tools: The tools are all made with dermatologist grade surgical steel to allow safe sterilization; these manicure pedicure accessories are strong and built to last. A Manicure Pedicure kit is ideal for XMAS, Christmas, birthday, mothers and father\'s day, marriage, thanksgiving, Valentine\'s Day and all further occasions. Impressive 18-in-1 personal grooming kit has it all & then some! Fashionable crocodile skin black leather case, very stylish & convenient. Tools are sharp & helpful, includes facial tools!